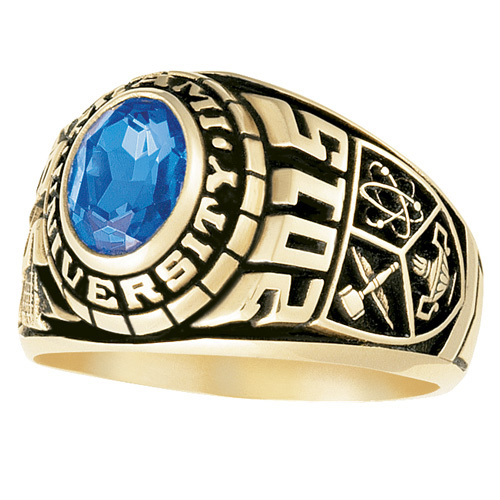 Honor her achievements with the 18kt yellow gold Traditional college ring. The name of the school appears around the 8mm x 6mm oval stone. Personalize side emblems and engravings and the stone color of your choice. Solid back, standard fit. Handcrafted in the USA by Gold Lance. First choose your state, then select a college or university from the menu that appears below. Do not enter a 4-year college in this field. We will not be able to make your ring. Inlay your encrusting in gold on your stone. Choose an encrusting from the menu above and it will appear below. Looks best with darker stones. Hint: To engrave the graduation year, select the Standard Education side emblem. Must be a valid degree. it's too large for me and it's not like the picture. the center stone is too small. I don't like it.